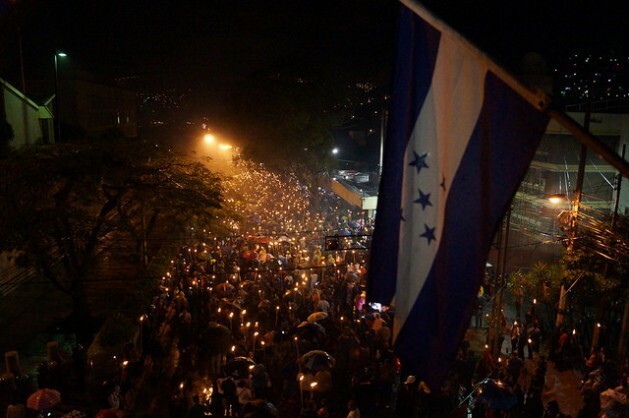 TEGUCIGALPA, Jul 21 2015 (IPS) - A Honduran spring is happening, led by young people mobilising over the social networks, who are flooding the streets with weekly torch marches against corruption and impunity. Since late May, the peaceful movement of young people who declare themselves “indignados” or outraged has broken down the media’s resistance to cover what is happening, and has brought hundreds of thousands of people out on the streets in Tegucigalpa and 50 other cities around the country. The torch marches are demanding the creation of an international commission to fight corruption and impunity, purge this Central American country’s institutions, and strengthen democracy. The Oposición Indignada or Outraged Opposition citizen movement is largely made up of middle-class young people upset over the embezzlement of 200 to 300 million dollars in the country’s social security institute (IHSS). According to the investigations, some of the money was used to finance the right-wing National Party (PN), which has governed the country since 2010. The scandal also involved the purchase of equipment at marked-up prices, and of expired medications. The IHSS scandal is the biggest case of corruption in Honduras in half a century and has caused widespread indignation due to the consequences it has had for the health of Hondurans, who already suffer from the scarcity of medicines in the country’s network of public hospitals. The fraud and graft in the institution that provides social security and healthcare to both public and prívate-sector employees has severely shaken the government of Juan Orlando Hernández, whose four-year term began in January 2014. The president ordered the investigations. But he never imagined that the straw that would break the camel’s back would be the use of healthcare funds to finance the campaign that led to his election. So far, 10 checks totalling 147,000 dollars that went towards his party’s campaign have surfaced. But that figure could increase, if the investigation digs deeply enough, experts say. Hernández says the party will give the money back, and denies any involvement. The dozen or so people prosecuted in connection with the scandal include former deputy ministers of health, a former IHSS director and an influential businessman. But the investigators say the list will grow and that powerful governing party figures will soon be implicated. “What made us come together was the embezzlement, and knowing cases of friends whose relatives died in the social security institute because of the shortage of medications,” Gabriela Blen, a young activist who is one of the founders of Oposición Indignada, told IPS. “On the social networks we started commenting that young people can’t be so indifferent, and the idea of the torch marches emerged,” she said. In the last 13 months, the organisation – the Latin American branch of the New York-based Covenant House – documented the murders of 1,076 people between the ages of 13 and 27. Blen, 27, said that “in the beginning there were just a few of us, only 50 or 100 people who would come out to protest in front of the social security institute building. ‘There go those crazy kids’, they would say. This country of 8.4 million people is one of the poorest in Latin America: 60 percent of households are poor and 40 percent extremely poor, according to official statistics. Honduras is also one of the most corrupt countries in the region, along with Venezuela, Paraguay and Nicaragua, according to Transparency international, the global anti-corruption watchdog. And Honduras is not only plagued by corruption and impunity, but by violence. The homicide rate, 68 per 100,000 population in 2014 according to the Autonomous National University’s Observatory of Violence, makes it one of the most violent countries in the world. Over 60 percent of the population is young, and according to Casa Alianza, a child advocacy organisation, young people in this country are stigmatised as a result of the violence, much of which is gang-related, while policies aimed at boosting social inclusion are lacking. Blen says Honduras has woken up. Every Friday in Tegucigalpa, and on Saturday or Sunday in another 50 cities, hundreds of thousands of “indignados” or angry, outraged protesters pour onto the streets to demand the creation of an International Commission Against Impunity (CICIH), like the one operating in Guatemala since 2007. The media, which initially kept silent about the movement, is now covering it, although still in a marginal fashion or to discredit it. But society is sympathetic towards Oposición Indignada, which has also won recognition from the United Nations and the U.S. embassy. Members of the movement have met with representatives of the U.N. and the U.S. embassy to ask for support for their demand for the installation of the CICIH. Eugenio Sosa, an expert on social movements, told IPS that Oposición Indignada has the characteristics of a 21st century social movement. “These are citizen movements without the classic rigid, hierarchical organisational structure, but with horizontal, fluid chains of command instead. That is why this has gone beyond the country’s political, trade union and social leaderships,” he said. “Honduras is at an interesting historical juncture,” he said. The government has ignored the protesters’ demands and has presented its own comprehensive proposal to fight impunity and corruption, without including the creation of the international commission the movement is calling for. The demonstrators, meanwhile, reject the government’s plan. Hernández called for a national dialogue but without including the political opposition or the “indignados” movement. Alghough the president said the dialogue would be “inclusive and without preconditions,” only traditional actors from some 30 sectors on good terms with the governing party have been invited so far. The president also sought support from the U.N. and the Organisation of American States (OAS) to facilitate the dialogue. OPINION: Can the Violence in Honduras Be Stopped? The U.N. responded by sending a fact-finding mission which is to issue a report in a few weeks, and the OAS agreed to mediate talks but has not yet appointed facilitators. Shannon, who visited the country as part of a tour that also took him to El Salvador and Guatemala, said it would be smart for both the Honduran and the Salvadoran governments to consider setting up international commissions against impunity. Former attorney general Edmundo Orellana told IPS that the situation is becoming complex because no Honduran president has faced such strong pressure from society. But the movement – which has demanded that the president resign – says it will not engage in talks with the government until the CICIH is set up. “And they’re right, because if people in the president’s inner circle are implicated in the social security corruption, what is needed is not talks but impeachment,” said Orellana, the country’s first attorney general, who enjoys great prestige. Orellana was referring to Hernández’s tight control over the three branches of the state and over the attorney general’s office itself.